SEE NO EVIL: Duke, Nyong'O and Alex in a scene from the movie. ONCE again, Jordan Peele’s offbeat, quirky style of filmmaking is in full throttle, in Us, a clever fusion of horror and dark comedy that serves as a worthy follow-up to his Oscar-nominated debut, Get Out. Like its predecessor, Us is alternately humorous and jolting, entertaining your socks off while making a solid point about the dark and disturbing side of human nature. Written, directed and produced by Peele, the movie follows a close-knit four-member family whose lives will never be the same after returning home from a summer trip to the Santa Cruz beach. Santa Cruz has a sinister history, and young matriarch Adelaide (Lupita Nyong’o, terrific) is well aware of it. As a child, back in 1986, she had a traumatic experience there that she can never forget. 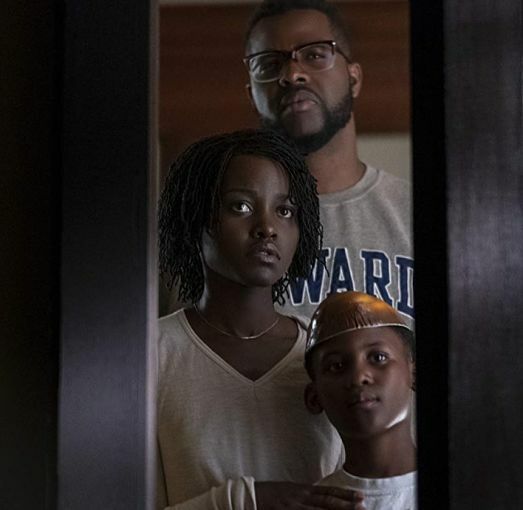 So when her husband Gabe (fellow Black Panther alum Winston Duke) suggests taking the trip with their kids, Zora (Shahadi Wright Joseph) and Jason (Evan Alex), she is understandably reluctant. Bad memories. She is fiercely protective of her children, especially Jason, whom she shields and counsels like a mama bear, intent on keeping him out of harm’s way. But nothing could prepare these parents for the nightmare that unfolds once they return from their seaside excursion. Another family, looking exactly like them, turns up at their front door in the dead of night – with scissors! – and refuses to leave. What does this mean? Have they been cloned? Adelaide and Gabe will have to draw on all their might and cunning to protect their family from these intruders, facing the fight of their lives. As humans, we are all capable of terrible, animalistic misdeeds, and this is one of the arguments most robustly explored in Peele’s film, which is heavy on metaphor and symbolism and subtle references to the occult.